As much as I love oven roasted potatoes and carrots, which we eat often, I always like to discover new favorites as well. 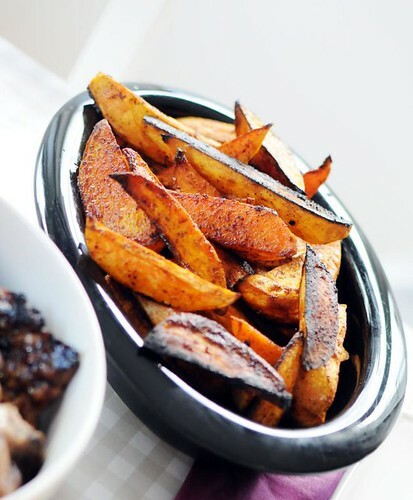 And these sweet potato wedges are excellent - both as a side dish with any kind of meat or chicken, but also as part of a finger-food spread. I like to eat them with a spicy, garlicky aioli, and my toddler loved them. Bonus: They cook much faster than regular potatoes! Peel the sweet potatoes and cut into wedges. Toss with oil, sugar and spices, in a roasting pan. Bake at 225°C for 20 minutes - they should be completely soft and cooked through, but a little crispy on the edges. Serve with some pressed lime and fresh coriander. Wonderful photo, can almost feel the crispyness of the wedges! My mom makes these all the time with an extra-spicy kick, and I love them! In my group of friends in Sweden, however, people are pretty split on sweet potatoes--some really like them, some think they're too sweet. What's your experience with that? Safe to make for a dinner party or not? Fröken Dill - sounds awesome. I've made a sweet potato gratin before, I bet chèvre would be great in that. Kate - I might not serve it as the only option, but as part of a larger spread, definitely! I tried it with potato & squash. Both good. Thank you. I've got a sweet potato that I've been mulling over for a few days now, this is just the recipe I need!